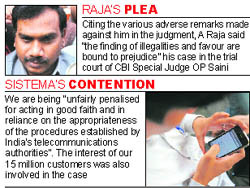 The government today filed a petition in the Supreme Court seeking review of the court�s February 2, 2012 judgment cancelling 122 licences issued in 2008 by the then Telecom Minister A Raja on first-come, first-served basis at 2001 prices. The government on Friday told members of the Joint Parliamentary Committee on 2G scam that the Supreme Court � by its latest order, cancelling the 122 telecom licences awarded by former Telecom Minister A Raja � had encroached upon its Executive powers. A stray �pin-shaped device� in Defence Minister AK Antony�s office on the first floor of the South Block has sent security officials into a tizzy after a suspicion was raised that it could be a bug (a remote electronic listening device). The Supreme Court today appointed its retired judge HS Bedi as the chairman of the monitoring authority that is supervising the investigations into 22 alleged fake encounter killings in Gujarat during 2002-06. �We would like the monitoring to be done by someone whose neutrality is completely beyond any question,� a Bench of Justices Aftab Alam and Ranjana Desi clarified in the order passed on two PILs seeking a thorough probe into all fake encounters in Gujarat. The PILs have been filed by lyricist Javed Akhtar and journalist BG Verghese. At least 40,000 Indians may be allowed to work in Europe, including 12,000 in Britain alone, under a secret trade plan between the European Union and New Delhi, a media report said, citing leaked documents. The EU has proposed that 40,000 Indian workers will be admitted to Europe without any labour market test as part of the plan to boost export trade with New Delhi, the �Daily Mail� reported, quoting a leaked copy of the EU/India Free Trade Agreement, which is due to be signed later this year. For school-goers in Bengal, protection from corporal punishment is a distant dream. No matter what the Right to Education (RTE) Act says about a stress-free environment in classrooms, the Mamata Banerjee-led TMC-Congress combine has its own definition of corporal punishment.